Many parents are now expecting their child care providers to have some knowledge of safe sling use, and to use slings with the children in their care. 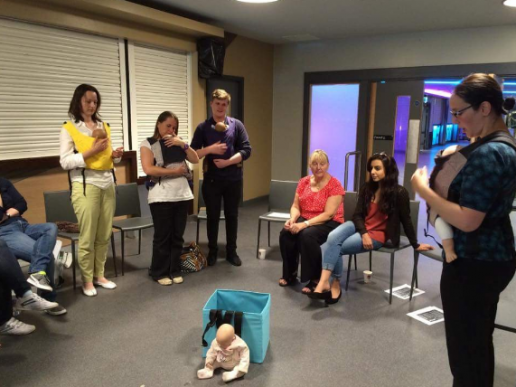 In Sheffield, we provide training for those working in child care settings (as well as a module of the Early Years Parenting PGCE at Sheffield Hallam University). Here Harriet (one of the course teachers) explains why sling use in a child care setting matters. Secure attachments with their primary care giver is vital to children’s social and emotional development. It helps them to grow into happy and healthy sociable beings. The relationship between a child and their parents, is of course, paramount. But what about those children whose care is provided by more than one person? What if their care provider is absent for periods of time due to work or illness? My husband and I work full time. Our two children have attended nursery since they were 6 months old. Between them they are at nursery for 80 hours per week. We have seen first-hand the difference that a strong attachment with nursery staff can make. For those children who are cared for by extended family or private care providers, building bonds with those carers is critically important. A strong attachment with nursery staff can make a big difference to children’s happiness and comfort, and also to parent’s confidence in leaving their babies with a childcare provider. Here in Sheffield, where the sling revolution is well and truly underway, nurseries are telling us that prospective parents are asking if they practice babywearing. Parents are listing use of slings as one of the criteria they are using to base their decision of childcare provider. How can sling use help in child care settings? Slings can help carers to hold children close, responding to their needs quickly and soothing children who are upset. Childcare providers tell us how they put distressed babies or tantrumming children into slings and feel them calm down, as they are rocked and swayed in the carrier, often falling asleep. 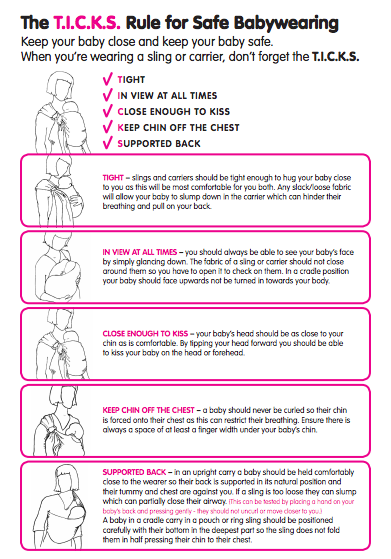 Slings are particularly helpful for providing familiarity for children who are already carried in slings by their parents. Using slings with these children can help replicate the routine they have at home and provide a familiar source of comfort. Slings enable babies to be carried at height, seeing the world through the eyes of the person carrying them. It provides a new perspective for them, being able to observe how their carer interacts with the world, how they communicate with other people, how they behave. This observation and learning helps their social and emotional development as well as their language acquisition. Slings also provide a safe haven for over-stimulated over-tired babies and children. 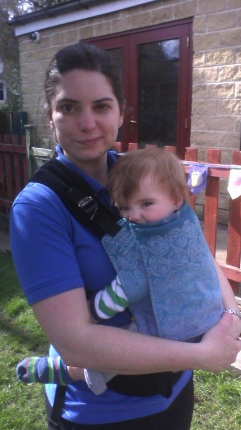 Holding a baby close in a sling provides them with some respite and rest during a busy and active nursery day. As well as the emotional and social benefits, for childcare providers, using carriers has obvious logistical and practical advantages. 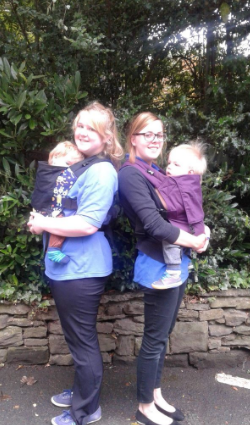 Slings can be used on day trips and walks, whilst one baby is in a sling, the same carer can push a double buggy, maintaining the 1:3 staff to child ratio. Of course, whichever sling is used, safety guidelines must be followed. The most important aspect is to ensure children are able to breathe easily; once babies are over 3-4 months they can hold their own heads up and protect their own airways. Ensuring they are not too hot is also important. The best known safety guidelines in the UK are the TICKS guidelines. Comfort for children and for the staff matter, as well, so choosing a comfortable sling is a good idea, it is worth trying a few first. 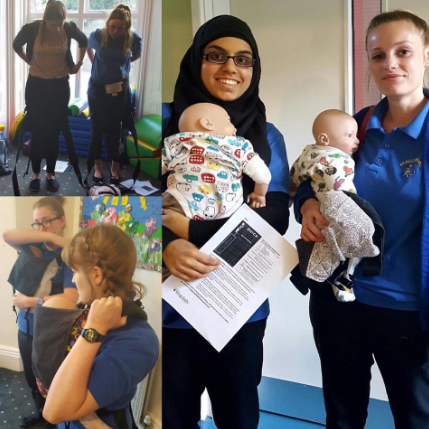 If you are a childcare provider using, or thinking of using slings, it is a good idea to undertake staff training and introduce a policy and consent forms. This will give you a chance to try some carriers and see what will work best for your needs. Parental consent and the consent of staff members should be secured before putting a baby/child in a sling.